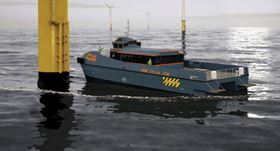 Recently workboat operator Offshore Turbine Services (OTS) took delivery of a versatile catamaran, one of a trio of wind farm service vessels (WFSVs) intended to convey personnel and equipment to and from wind turbines constituting the extensive London Array wind farm in the Thames Estuary. their composite structures are resin-infused. Why composite? Primarily because combining fast transit at sea with acceptable fuel consumption requires low vessel weight. Fuel economy is key, especially as offshore wind farms get built ever further from support facilities ashore. CTruk says its composite catamarans are up to 40% lighter than competing designs, making them highly fuel efficient. Other claimed advantages include higher speed for the same engine power, shorter build time, better hydrodynamics due to the ability to mould hulls to optimum curved shapes, superior durability in the absence of metal corrosion, reduced material fatigue and better acoustic isolation. Emphasising the fuel economy advantage, Nick Bright relates how, during a trip out on CWind Alliance, the first 20 tonne vessel CTruk built, he phoned his son who, by chance, was that day running a 15 m aluminium catamaran for another company. Since the vessels were somewhat alike and carried similar payloads, father and son agreed to compare in real time the fuel consumption of the craft when running at a representative service speed of 20 knots in similar conditions. In the event, the CTruk cat was nearly 45% more efficient, despite being 3.5 m longer. Calculations have suggested that, over a five-year O&M contract, a CTruk 20T operator could save over £1 million in fuel costs, compared with operating an aluminium craft of similar size. Calculations have suggested that, over a five-year operations and maintenance (O&M) contract, a CTruk 20T operator could save over £1 million in fuel costs, compared with operating an aluminium craft of similar size. CTruk’s catamaran WFSVs are considered sea kindly, riding the waves well so that personnel can arrive at turbines fresh and able to start work. Fears that a lighter vessel might be more prone to wave-induced motions during the tricky transfer of personnel from the highly mobile vessel to the static turbine base have, says the company, proved unfounded. Why resin infusion? When CTruk came into being in 2009-2010 in Brightlingsea on England’s east coast, the founders’ vision was to produce a generation of workboats that would perform well and economically at sea. With backgrounds that encompassed reinforced plastic construction, they wanted to build on this foundation but with a technology that was an advance on the manual wet lay-up techniques that had long predominated in boat building. Ideally, the method should provide high product quality and consistency while ticking all the environmental plus health and safety boxes. Resin infusion meets these requirements and is generally less expensive to implement initially than its main competitor, prepreg fabrication. Resin content, while not quite so tightly controlled as with prepreg, is kept only to the level required for complete impregnation, any excess resin being sucked out from the vacuum bagged assembly. Resin economy goes hand in hand with weight minimisation. Fabricators can take the time necessary to lay the dry fabrics precisely, without pressure from the dreaded ‘resin clock’ (gel time). Human variability, to which hand/wet lay-up is so prone, is much reduced and high void-free quality can be achieved. Being essentially a closed mould process, vacuum infusion is clean with minimal volatile emissions. On the downside, success does require careful process planning and modelling/experimentation so that the distribution of resin inlet ports and tubes enables full and even impregnation to be achieved. Careful attention must be paid to vacuum integrity as the slightest leak can lead to incomplete infusion with likely loss of the product, which may be a hull or deck. Significant investment must be made in quality consumables, vacuum pumps, process modelling software and other infusion infrastructure. By now CTruk has a well developed system for infusing its WFSV range which includes the 18.5 m long 20T that can carry a 20 tonne payload, a larger 28 m long, 50-tonne payload 50T cat and a 19.5 m SWATH (Small Waterplane Area Twin Hull) craft in which the deck and superstructure are joined by sidewalls to two bulbous torpedo-like hulls that provide the buoyancy and ride below the waves so that occupants of the vessel experience a smooth ride even in heavy weather. Part 2 of this article will be published on ReinforcedPlastics.com next month and will discuss the use of composite vessels far offshore. This feature was also published in the November/December 2012 issue of Reinforced Plastics magazine.